A potent potable in honor of the 40th anniversary of Jaws. If I have to explain, well, then you’ve got some movie to watch, eh Chief? Place water and jam in microwave save container and nuke 1 minute on high. Stir then nuke again for 30 seconds or until syrup mixture boils. Meanwhile, place ripe and dry apricots in a clean bottle or jar (Ball style). Pour syrup over apricots then top with the vodka. Cover and allow to steep for 7 days at room temperature. Strain through cheesecloth and enjoy straight up or in any number of classic cocktails like a Golden Slipper or a Yellow Parrot. What does “ball style” mean? What if I put more than 18oz of vodka in? Just let it steep longer or will I just get an apricot vodka? I’ve already steeped 7 days and it still looks fairly clear! I watch Jaws at least once a week. Now I will be drunk as a Quint at least once week. I’m curious what adjustments would be made to make a schnapps? What if you can’t find fresh apricots? Isn’t this more accurately an apricot vodka? 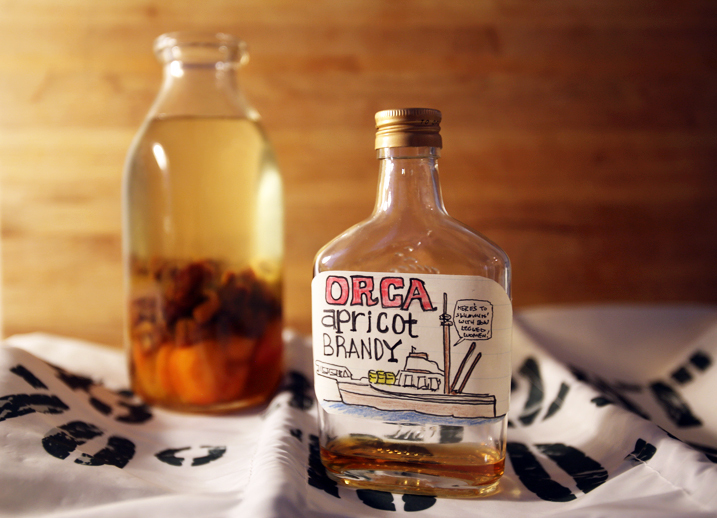 An infused fruit vodka is different from a fermented brandy made with fruit, isn’t it? Though strong, brandy is still not as high octane as a dis tiled grain or potato spirit, and thee are mellow aged fermentation qualities in good brandies. Just sayin’, distiller spirits, brandy, grappa, liquor, all have unique qualities – don’t they? Any chance you can post your label drawing! I want to make a batch for friends this summer and would love to make up some labels and your drawing would rock!!! What other fruits would be good if you don’t care for apricots? Would it work with blueberries or strawberries or peaches? @Bill… you will want to use a white brandy for best results. This recipe is really a cordial, and a delightful one at that. This seems like it would make something more along the lines of an apricot schnapps. How would the recipe need to be tweaked if you want to use brandy as the base? That’s a bit like a Dutch meisjes recipe, which is apricots aged in sugar and brandy. Or any alcohol, really.